One of the most spectacular and harrowing events in the history of the Great Plains was the Blizzard of January 12, 1888. Other storms had produced colder temperatures and greater amounts of snow. It was the combination of gale winds, blinding snow, and rapidly falling temperatures that made the 1888 blizzard so dangerous. The storm's full fury lasted up to eighteen hours in many parts of Nebraska. Because of the suddenness of its onset, the blizzard caught many children away from in one-room schoolhouses. In an attempt to rescue her two sons, Charles and Thomas, from school Mary Masek of Milligan trekked nearly two miles to the schoolhouse. Finding the building empty, she started for home, but she never reached her destination. She was found frozen to death huddled near a cottonwood tree, only a short distance from a neighbor's farmhouse. 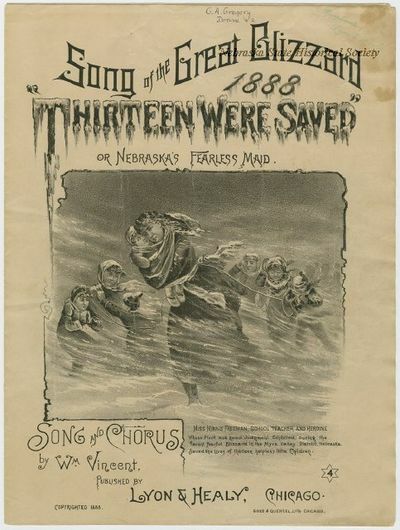 The Blizzard of 1888 created the scene for heroic acts. Mary Masek, like many Nebraskans, fell victim to one of nature's most violent displays while courageously attempting to save the lives of her children.